Venice attraction-guides.com - Venice, Italy attractions guide Venice Basilica San Marco (St. Mark's Church) information about attractions, history, open hours, admission charges, treasures, statues, Pala d'Oro, cathedral of Venice, state ceremonies, rooftop views, location and address, tel / telephone number, general tourist information about Basilica San Marco (St. Mark's Church) in Venice (Venezia) area, Italy (Italia) IT - Last updated 30/10/2012. The Basilica San Marco (St. Mark's Church), in the famous San Marco area of Venice, features more than two square kilometres of beautiful mosaics and the Basilica of San Marco (St. Mark's Church) is without doubt one of the most famous sights associated with Venice. 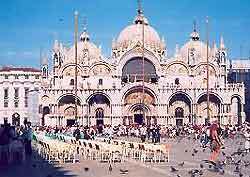 Venice's Basilica San Marco (St. Mark's Church) contains a wealth of wonderful treasures, including the 'Pala d'Oro', a masterpiece in gold, many precious glasses, historic amphoras, cups, carvings and highly detailed stone statues. The Basilica San Marco (St. Mark's Church) is a simply vast church and was built on a Greek cross plan and crowned with five huge domes. Originally a shrine to St. Mark in the 9th century, Venice's first church on this site was destroyed by fire and the second building was demolished in the 11th century to make way for a more impressive building. Over the years Venice's Basilica San Marco (St. Mark's Church) has been remodelled a number of times, becoming the cathedral of Venice, where many important state ceremonies are held. A lift is available at the Basilica San Marco (St. Mark's Church), which transports visitors to the top, which offers fabulous panoramic views over the Venice rooftops and lagoon. The Basilica San Marco (St. Mark's Church) is a major landmark in Venice, attracting enormous crowds, so it is always a good idea to arrive early.